This past week, I coined a term that I have been using, channel “cobblers.” I am using the term channel cobblers because these companies are often not the ones designing server PCB or system components. They are not designing software. Instead, they are taking an existing platform and exploiting market discounts to provide lower-cost servers to their clients. This is a non-negligible portion of the channel market and one that AMD EPYC does not currently address. Cobblers are a valuable market asset. They know that if they cannot get a CPU from a company like HPE at a solid discount, they can instead purchase it from a distributor like Ingram, and then seek Intel program rebates or marketing assistance for the higher-end SKUs they sell. Likewise, cobblers know that if they can get a high-end SKU at a high server level discount at the end of a quarter, they can sell them on the secondary market at a decent price. That is just the CPU side. Cobblers also can work their expertise on procuring and integrating storage, RAM, and add-in cards making them a textbook economist-predicted market participant. 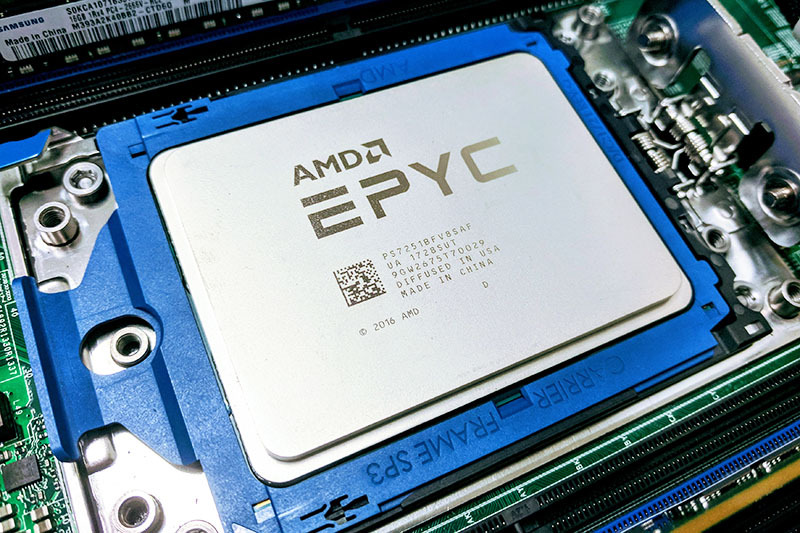 In this piece, we are going to use the CPU side as an example by way of showing an underserved market that AMD needs to address with EPYC. 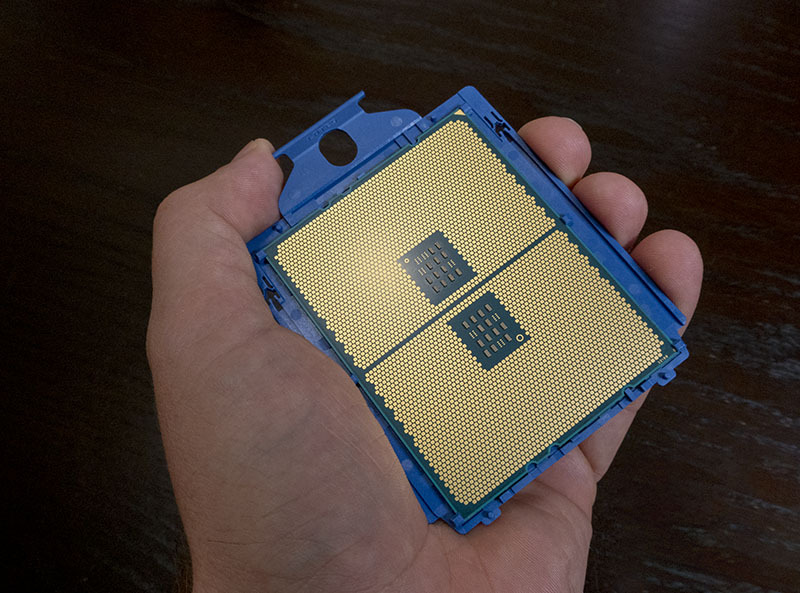 If you read our Intel Xeon Bronze 3104 v E5-2603 V3 and V4 Three Generations Compared piece, you will have seen the $210 Intel Xeon Scalable CPU and the generations of CPUs in the same segment that have preceded it for more than half a decade. The Xeon Bronze 3104 along with the nominally improved Xeon Bronze 3106 one may hear me discuss as “light the platform” parts. 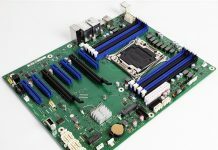 If you just need a physical server to show up on a network or perhaps are making a storage-focused server, the Intel Xeon Bronze parts are all you need to get the memory channels and PCIe lanes running and Linux installed. The light the platform segment is larger than many will give it credit for. Xeon Bronze CPUs typically are sold in systems with a single DIMM per CPU, even with six to twelve slots available. Indeed, if one looks at the current HPE ProLiant DL380 Gen10 QuickSpecs, three of the thirteen pre-configured models utilize Intel Xeon Bronze 3104 or 3106 CPUs. As someone who does the most in-depth independent server reviews in the industry, if you want Intel Xeon Bronze 3106 level performance with 16GB of RAM, quad 1GbE and 8 drive bays, those configurations are not the best performance per dollar ratio you will find. Indeed, the Intel Xeon E-2136 can fit that basic spec and cost less upfront and over time. HPE offers these servers as we saw in our HPE ProLiant DL20 Gen10 Review. A large number of those SKUs are being utilized for the channel cobblers which in turn drives entry-level configurations. 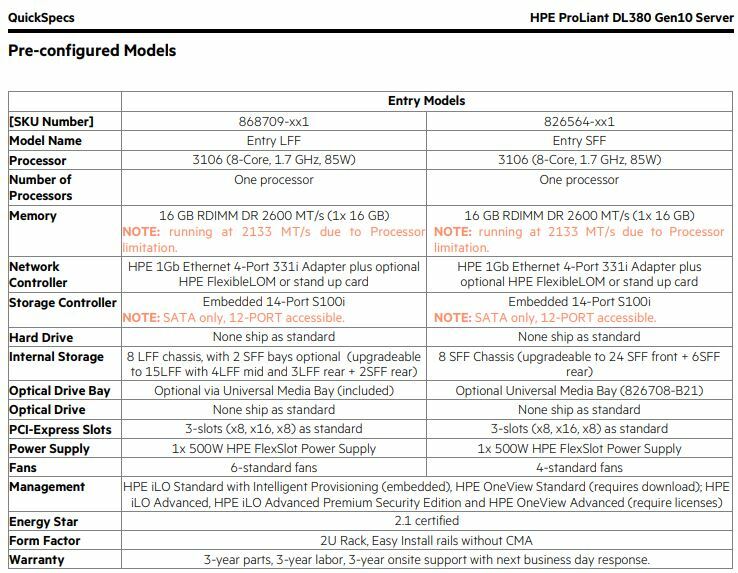 In the Mercury Research market share numbers, Intel gets a very interesting bump from what I will term “channel cobblers.” Channel cobblers will buy systems like the HPE Pre-Configured quick ship models (above), or those from other vendors like Supermicro or Dell EMC. Cobblers will remove CPU(s), RAM, and potentially other components. They will then reconstitute a server sourcing components from elsewhere, and sell excellent systems to their customers. For our IDC and Mercury Research market share numbers, this is a perfect example of divergence. One HPE ProLiant DL360 Gen10 system was sold and counted in the IDC Server Tracker numbers. Three CPUs may have been sold. One was an Intel Xeon Bronze, and after cobbling, perhaps two Xeon Gold parts were purchased and installed. 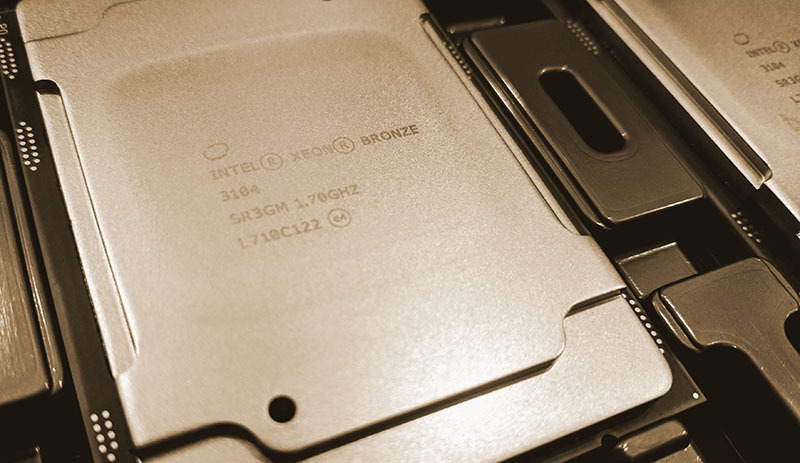 The Intel Xeon Bronze SKUs may collect dust on a shelf, find their way as test CPUs, or be sold on the secondary market and eventually find their way into the corners of the industry. While the Intel Xeon Bronze 3014 starts around $210 list, the AMD EPYC 7251 starts around $475. I have told AMD executives that they need a lower cost part. I understand their hesitation. From a people perspective, there are few engineers and marketers who set out to make their life’s work to build a product that most often will become waste (direct mail providers aside.) At the same time, AMD needs to engage here to attract cobblers. AMD EPYC Rome does not necessarily align itself well to this market if that I/O die cost is substantial. AMD may bin the I/O dies to the point that it creates a Xeon Bronze competitor out of “waste” parts. My suggestion to AMD create a processor without specifications. Call the product “Scott’s Forrest” which AMD folks will smile at, with a model number of “AMD EPYC 7SF2.” The product will be the equivalent of a manager’s special at a bakery. You get a maximum TDP rating, all PCIe and DIMM channels lit in at least 1DPC configurations, and then the rest is whatever you get. 2 cores or 51 cores. Naples or Rome cores. Full cache or 1/8th cache. Sell the scratch and dents on the CPU line that still fill the role of “light the platform” for say $310 and get more competitive with Xeon Bronze. In the worst case, the cobblers will have a better option to order a complete server with a low-cost EPYC for later replacement. In the best case, an entire industry of cobblers will arise binning the eclectic EPYC 7SF2 parts and selling them. For those who do not care and toss their Intel Xeon Bronze CPUs, achieving price parity is all that is needed. For those who are passionate about their craft, the AMD EPYC 7SF2 will become tantamount to the holy grail for cobblers. At some point, AMD needs to address the $475 price tag on their lowest-end CPU. One can make the valid point that at a system level, forgoing an Intel Lewisburg PCH should offset the additional cost to a degree. That may be a valid assumption, but I urge AMD to get creative and address the channel cobbler market with a lower cost light the platform part. Companies like HPE, Dell EMC, and Supermicro see anywhere from 25-66% of their sales from channel partners, and a significant portion is from cobblers. As an added benefit, each time a lower-end CPU is purchased with a system and replaced, it increases unit sales which would help bolster AMD’s Mercury Research market share gains. We have seen AMD attack the frequency optimized segment with the AMD EPYC 7371 at an awesome price. At some point, AMD needs to focus on the less exciting market niche. I work as one of your ‘channel cobblers’. Thanks for giving us airtime. I feel like you’re always talking about the big guys, but then there’s the way things actually get done. We do this with HPE and Supermicro’s all day long. Supermicro has become anti-cobbler now that they’re requiring more systems to be sold complete. They used to sell everything as barebones, but their higher-end systems they’re now forcing channel partners to buy CPUs, RAM and storage from them. That hurts our business and makes HPE more attractive. The first rule about Intel Rebates is that you can’t talk about Intel Rebates. I don’t know how I feel about STH shedding light into our corner of the market. Just you watch, they’ll call it the EPYC 7PK2 just to give you an “honor” of dreaming up the “junk” part. It’s actually a good idea since they’re aiming for 3 gens of CPUs in SP3, right? I agree the P series skews this too much. Maybe I’m way off here, but I thought that the entire point and innovation in AMD’s new scalable architecture was that they’re limiting waste /already/ by using multiple Zeppelin (or whatever the new one is called) dies to make the whole package. I have no idea what their yields are like, especially compared to Intel, so maybe someone with more industry knowledge can comment as to the possibility of what I’m suggesting. The thing is I don’t AMD produces enough TR/EPYC cpus to have a enough salvage under the lowest bin to justify what you suggest. Intel’s production runs are probably around 8x-10x that of AMD per year and that helps a lot with segmentation and what you sensibly suggest here. Maybe next year. KD’s point is kind of what I was thinking. If you’re a much smaller player as AMD is, with smaller production capacity, why would you use your capacity to ship into the lowest margin segment of the market. Much better off taking market share at the mid to high end where the margins are better. They don’t have the money or scale to compete with Intel everywhere. Gotta pick’n’choose your battles.